As I mentioned in my last post, I had a meeting with my partner, Jessica, for Raks Makam. This comes on the tail end of me performing a fully fleshed out version of Kor Arab (otherwise known as Kor Ərəbin Mahnısı). I had performed an excerpt of this within the context of a longer collage piece with one of my other dance/music duets, Secondhand, but had only worked out a version for solo cello and voice for Friday’s Terrabeat Cultural Showcase. I’ve done a number of tunes from Central Asia with il Troubadore and Ahel El Nagam, but in those cases the tunes were either as an extension of Middle Eastern tunes for bellydancers, or Persian Pop (e.g. Googoosh). Since Raks Makam is a project that focuses specifically on music and dance from Central Asia and the Silk Road, the material will be focusing more specifically on traditional and art music from those regions. Really, that’s a question I ask of myself when I hear music from anywhere! The obvious difficulty with working up solo versions of this music is distilling the music into two voices (voice/melody or voice/drum) rather than having at least three (voice/melody/drum). One of the reasons for meeting with Jessica was to talk about our options. The quote above is from the liner notes to Kor Arab (otherwise known as Kor Ərəbin Mahnısı) which is track ten on the Silk Road Project CD, Silk Road Journeys: Beyond the Horizon. The music was written by Fikret Amirov and the lyrics by Hüsayn Cavid. Since I spent some time thinking about the origins of bowed string playing a couple of days ago I knew that I really wanted to say something about this instrument which I had just discovered while writing the post about origins. The chaganeh is one of the few examples of world bowed strings that really closely matches the physical set-up of a cello and I was just thrilled to see a picture of it at the Wikipedia entry for kamancheh as I was writing the post mentioned above. 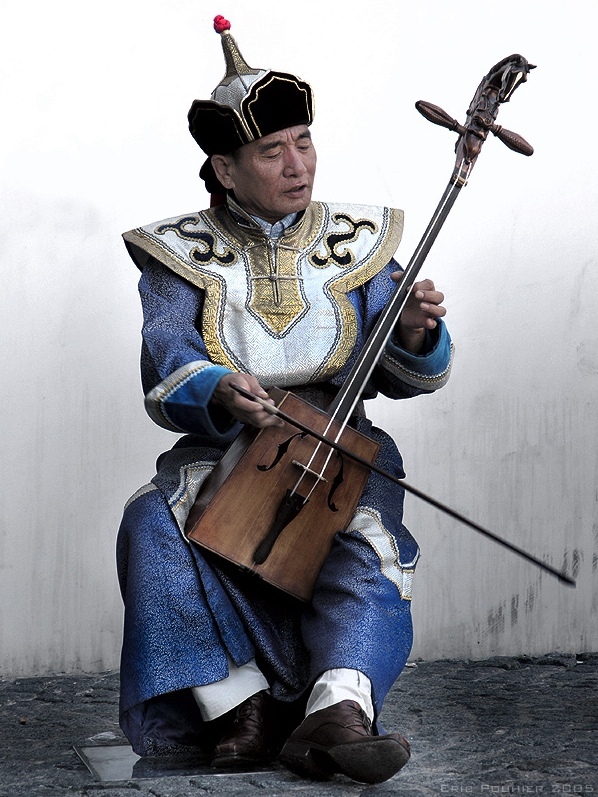 The kamancheh itself is an upright bowed spike fiddle as is the chaganeh, but as you can see from the photo above, the spike of the chaganeh is long enough, and the body of the instrument is big enough, that a musician can sit in a chair and play it upright and held between the legs. As noted in the Wikipedia entry, the instrument is said to come from Azerbaijan, but with the little time I’ve had to look it up, I have come across other references stating the chaganeh originated in Iran. Until I know more about the instrument I’ll simply say it’s of Central Asian origins.